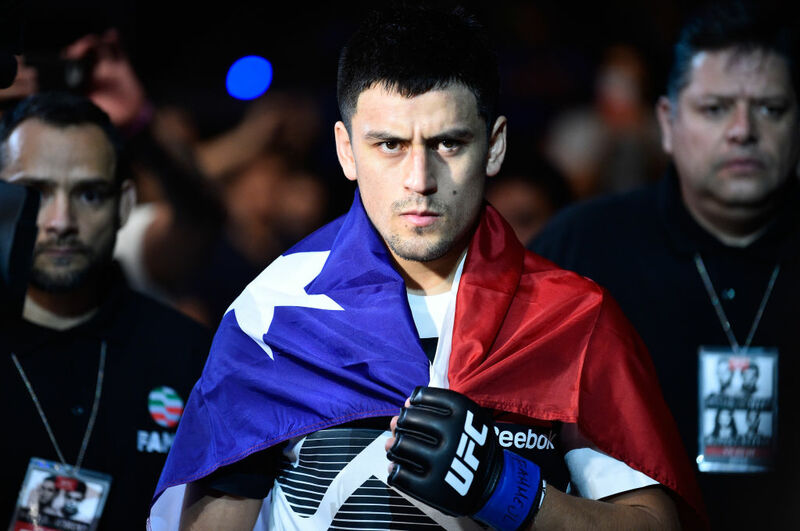 The UFC’s first event in Santiago, Chile this weekend offers an exciting fight card filled with emerging talent and capped by a crucial matchup in the welterweight division pitting Demian Maia against Kamaru Usman. With 13 fights packed with explosive potential, the fans that pack the Movistar Arena on Saturday, May 19 should be treated to a terrific night of action inside the Octagon and, as an added bonus, they’ll get a chance to familiarize themselves with a crop of up-and-coming competitors. Here’s a closer look at three of those athletes. This is On the Rise: Santiago Edition. You best believe that the roof of the Movistar Arena is going to come off when Rivas makes the walk to the cage for his bout with Guido Cannetti. A native of Cholchol, Chile, the 26-year-old bantamweight is the lone native son competing on Saturday’s fight card, and while there will likely be plenty of vocal support in the building for the various other South American fighters on the card, the volume should be at its apex when Rivas’ music hits. A contestant on Season 1 of The Ultimate Fighter Latin America, Rivas collected consecutive victories following his time on the show before being diagnosed with testicular cancer. He returned to action last August in Mexico City, dropping a decision to Jose Alberto Quinonez, but the simple fact that he was back in the cage was the important takeaway from that particular contest. Now he’s back with a second full camp under his belt and eager to rebound from his first professional loss in a showdown with Cannetti, another member of that Season 1 cast. With his medical issues under control and the rust of time away already shaken off, Saturday’s contest should be a better representation of what the 135-pound prospect brings to the table. While she doesn’t carry the hype or upside of contemporaries like Mackenzie Dern or Aspen Ladd, Lee has built a strong following and solid record plying her trade with Invicta FC and Legacy Fighting Alliance over the last three years. The 29-year-old holds victories over TUF 26 contestants Ariel Beck and Rachael Ostovich and arrives in the Octagon riding a four-fight winning streak. Tall and rangy, Lee augments her Muay Thai striking base with a solid top game on the ground, boasting more wins by submission (four) than stoppages due to strikes (two). Lee debuts this weekend in an intriguing pairing with Veronica Macedo, who made her Octagon debut in August 2016 fighting at bantamweight with a loss to Ashlee Evans-Smith. If “KGB” can stride into the UFC cage and extend her winning streak to five with an impressive victory right out of the gate, the Texan would put herself in a good position to get a significant push as things in the women’s flyweight division start to pick up. Peru’s Bandenay made a splash in his promotional debut, collecting a 26-second knockout victory over Martin Bravo on two-weeks’ notice last summer in Mexico City, and now he gets a chance to make an immediate move up the divisional ladder with this clash against Gabriel Benitez, who enters off a solid decision win over Jason Knight. Just 23 years old, Bandenay has won six straight, all by stoppage, heading into this one and he profiles as the kind of promising young talent who could grow by leaps and bounds between contests, as he has tremendous size for the division and obvious explosive offense. Benitez has logged six Octagon appearances and is coming off his best showing to date – a one-sided decision win over Knight back in December that has left him on the fringes of contention in the featherweight ranks - and if Bandenay can roll in and steal his thunder this Saturday, the young upstart could add his name to the growing list of emerging talents bubbling up in the 145-pound weight class.